Grateful Dead | "A Song Every Day"
Posted on August 23, 2015 by vspatz	in Ethics, faith action, Healing and tagged #RippleEffect, Grateful Dead, Playing for Change, Playing for Change Day. Continuing the discussion, at “If a corpse be found…”, about the need for new approaches to meeting our communal responsibilities. Residents in some of the most affected neighborhoods of the District are asking for prayers, calling on everyone in and around the city to #Pray4DC, as one united town. If you know others who engage in intercessory prayer, please pass along this prayer concern. And, however you approach such requests yourself, please keep the need for “one DC” in mind. Also, if you know members or clergy in other congregations who might be willing to prayerfully acknowledge DC’s losses to homicide — as Temple Micah has begun to do — please ask them to sign up for #SayThisName. Learn a little about child trauma and how it affects learning and then advocate for trauma-sensitive schools – particularly in Washington, DC. The District also needs trauma-response units to help young people on the scene cope with the violence they too often face. For DC residents, please note particularly, that the DC Council held a roundtable on this topic in June and should be poised to act. This one involves the Grateful Dead — some Temple Micah (DC) people know I hate to let a summer pass without somehow bringing in the Dead. And those who follow such things know this summer is the Dead’s 50th anniversary…. The #RippleEffect Campaign — named for the Grateful Dead son, “Ripple” — simply involves engaging in acts of kindness or telling about a how an act of kindness affected you… and then encouraging others to do so as well, creating a kindness ripple. Part of the effort involves social media, for those interested. But it’s certainly not required for the spreading of kindness, or for doing so with the intention of helping to heal all that is broken in DC and beyond. A second goal of the Ripple Effect Campaign is to raise awareness and funds for a project called “Playing for Change” that teaches music and dance to young people around the world, including in the U.S. Playing for Change (PFC) helps youth use music for everything from improving education to resolving conflicts, preserving cultural heritage, and building community, locally, and connections worldwide. 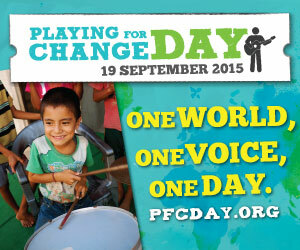 PFC Day — with activities in 61 countries last year — is an annual effort, scheduled this year during the Days of Awe. This day of music, peace, and change keeps instruments, music instruction, and inspiration flowing to children around the world, … and contributes to positive vibration that connects and inspires us all. The related dvar Torah, “If a corpse be found…”, continues the discussion of ripples — ones of pain, outward from bullets and bombs, and ones of healing. Is anyone else interested in pursuing a Playing for Change activity in DC and/or the Jewish world? Posted on July 25, 2011 by vspatz	in Bamidbar, God, Jeremiah, Passover, prayer, Rosh Hashanah and tagged Bob Dylan, Doctor Zhivago, Grateful Dead, Jeremiah, Knockin on Heaven's Door, Matot (Mattot), Must Love Dogs, Shawn Zevit, Standing on the Moon. Of course, Diane Lane and John Cusack do get together, even though things still don’t look so good for Yuri and Lara. And I believe the Must Love Dogs view of Doctor Zhivago has a lot to say about this week’s Torah portion Mattot (Numbers 30:2-32:42) and about our prayers.